NASHVILLE — Tennessee's Republican House and Senate speakers say they don't anticipate Gov. Bill Haslam vetoing a trio of controversial measures that have either already reached the governor's desk or soon will. Haslam, a fellow Republican, has previously raised questions about all three, including a resolution directing state government to sue the Obama administration over the federal government's refugee resettlement program. The second measure, a bill, phases out Tennessee's Hall income tax which is a 6 percent levy on stock dividends and interest income. The third is a bill stripping a year's worth of funding for the University of Tennessee at Knoxville's Office for Diversity and Inclusion, diverting the money to engineering scholarships for minority students. House Speaker Beth Harwell, R-Nashville, said Haslam "indicated toward the end [of lawmakers' annual session] that he didn't see anything that would cause us to need an override session. "So," Harwell added, "I'm anticipating that means he's going to sign them" or, she allowed, the governor could allow one or more to become law without his signature. Senate Speaker Ron Ramsey, R-Blountville, told reporters "I don't think he'll veto anything. That's just my gut feeling. No, he hasn't told me that. I think if he had [intended to veto] I would have known by now - I'd like to think I would have. Are there some he's holding that maybe become law without his signature? Possibly." Discussions about Haslam vetoes became a major topic among fellow Republicans after the governor vetoed one controversial bill. It sought put state government's stamp on the Holy Bible by making it Tennessee's official book. House supporters later unsuccessfully sought to override Haslam's veto and some Republicans worried other bills or measures might be struck down and argued for a veto override session. But that was headed off with some lawmakers indicating there was an agreement of sorts between Republican legislative leaders and the governor over vetoes. Asked whether Haslam had agreed to let other measures effectively "ride" having easily blocked the Bible bill override, Ramsey said it was "nothing quite like that. But I'll admit before we left over whether to have a veto override session or not I got the strong hint we wouldn't need one. But at the same time did i ask specifically about bills? No, I didn't. So that's the reason I don't think he will. But whether he signs them or not is a whole different story." Tennessee governors can sign bills into law, veto them or simply not sign them and thus allow them to become law. Haslam administration officials did not immediately respond to a request to address the two speakers' comments. One of the disputed measures, Senate Joint Resolution 467, directs Tennessee Attorney General Herbert Slatery to join Alabama and Texas in suing the Obama administration over the federal government's resettlement program. Long-simmering resentment over the program, which the state does not control but does incur some costs such as educating refugee children, erupted publicly this year in the following last December's terrorist attacks in Paris. Ramsey himself co-sponsored the resolution. Haslam has previously raised concerns saying all indications are terrorist threats are coming from areas not connected with the refugee resettlement program. He also has questioned legislation that requires the attorney general to act. If Slatery refuses, the resolution also would allow the General Assembly state to retain private attorneys from the Thomas More Law Center, a nonprofit group that warns on its website that "Radical Muslims and Islamic organizations in America take advantage of our legal system and are waging a 'Stealth Jihad' within our borders to transform America into an Islamic nation." The Tennessee Immigrant and Refugee Rights Coalition (TIRRC) as well as the Tennessee chapter of the American Civil Liberties Union have urged Haslam to veto the resolution. TIRRC officials say it would make Tennessee among the "most unwelcoming and hostile states for refugee families. This dangerous resolution also provides political cover to those who will seek to advance more extreme policies or act out their xenophobic biases." Meanwhile, Senate Bill 1912 deals with the University of Tennessee's Office for Diversity and Inclusion. Socially conservative Republicans had already been walloping the office over its suggested use of gender-neutral use of personal pronouns like ""ze, hir, hirs, and xe." The issue began boiling over when the diversity office's website encouraged employees to "ensure your holiday party is not a Christmas party in disguise." Two top Republicans, Sen. Mike Bell of Riceville and Senate Education Committee Chairman Dolores Gresham of Somerville called on UT-K Chancellor Jimmy Cheek to resign. That evolved into an effort to strip the office of funding permanently. But the Senate sponsor, Todd Gardenhire, R-Chattanooga, imposed a compromise of sorts by moving a version that stripped the office's $436,000 in annual funding for one year. It diverts the money on a one-time basis to engineering scholarships for minority students. The House sponsor fumed, wanting a permanent withdrawing of funding. But Gardenhire prevailed. A second bill would phase out the state's 6 percent Hall tax in 2022, decreasing it by 1 percent per year. 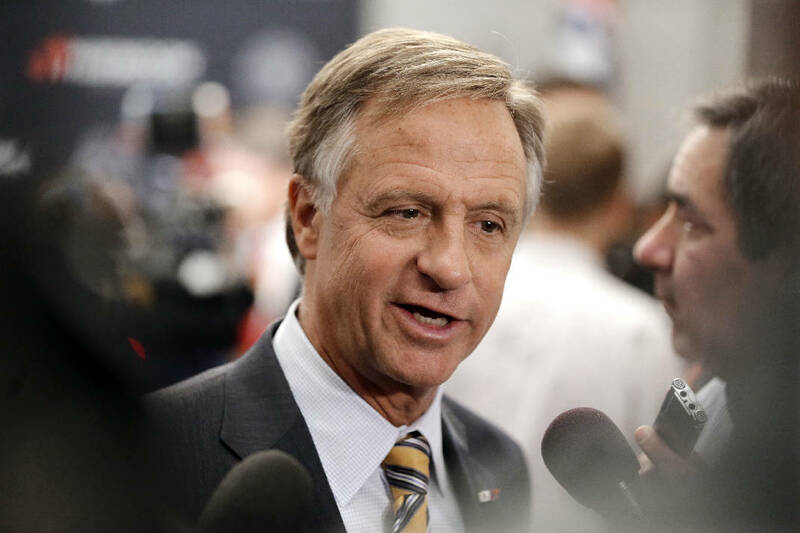 With fellow Republicans set on doing something about the tax, Haslam had agreed to cutting the rate from 6 percent to 5 percent with a stated intent to do more depending on future revenues. Instead, lawmakers would up with language requiring the six-year phase out. Cities, which split Hall tax proceeds with the state, object to the bill becoming law.